Ginger and artichoke have been a staple of traditional medicine for centuries.1,2 Ginger (Zingiber Officinale), part of the Zingiberacear family is native to South East Asia, China and India. Based on the appearance of the root, in Sanskrit ginger is referred to as Srngaveram, meaning, “horn root.” Ginger is a flowering plant, which grows to about one meter in height and is typically harvested in 8-10 months. The thick outer skin of the root must be removed before preparation or consumption. The applicable part of ginger is the rhizome and root, the active constituents being gingerols and shogaols. Artichoke (Cynara cardunculus) root, leaf, and stem have multiple properties making it a well-used herb in traditional medicine as well as current medicine. It is a perennial plant native to regions within the Mediterranean and is part of the Asteraceae family. Artichoke grows up to 1.5-2 meters tall, with a large bud and flowers developing out of the bud. The bud and heart are edible, while the choke (within the center of the bud) is inedible. Langner E, Greifenberg S, Gruenwald J. Ginger: history and use. Adv Ther. 1998 Jan-Feb;15(1):25-44. Salem M, Affes H, Ksouda K et al. Pharmacological Studies of Artichoke Leaf Extract and Their Health Benefits. Plant Foods Hum Nutr. 2015 Dec;70(4):441-53. Elsebai MF, Mocan A, Atanasov AG, Cynaropicrin: A Comprehensive Research Review and Therapeutic Potential As an Anti-Hepatitis C Virus Agent. Front Pharmacol. 2016 Dec 8;7:472. doi: 10.3389/fphar.2016.00472. Kirchhoff R, Beckers C, Kirchhoff GM. Increase in choleresis by means of artichoke extract. Phytomedicine. 1994 Sep;1(2):107-15. 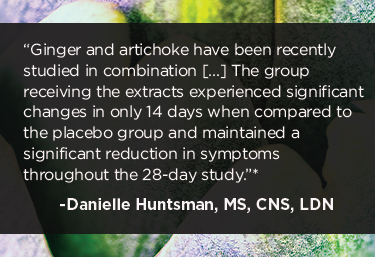 Holtmann G, Adam B, Haag S, Collet W, Grunewald E, Windeck T. Efficacy of artichoke leaf extract in the treatment of patients with functional dyspepsia: a six-week placebo-controlled, double-blind, multicentre trial. Aliment Pharmacol Ther. 2003 Dec;18(11-12):1099-105. Takeshita E, Matsuura B, Dong M, et al. Molecular characterization and distribution of motilin family receptors in the human gastrointestinal tract. J Gastroenterol. 2006 Mar; 41(3):223-30. Sikander A, Rana SV, Prasad KK. Role of serotonin in Gastrointestinal motility and irritable bowel syndrome. Clin Chim Acta. 2009 May;403(1-2):47-55. Takahashi T. Interdigestive migrating motor complex -its mechanism and clinical importance. J Smooth Muscle Res. 2013; 49: 99-111. Micklefield GH, Redeker Y, Meister V, et al. Effects of ginger on gastroduodenal motility. Int J Clin Pharmacol Ther. 1999 Jul;37(7):341-6. Pertz HH, Lehmann J, Roth-Ehrang R, Elz S. Effects of ginger constituents on the gastrointestinal tract: role of cholinergic M3 and serotonergic 5-HT3 and 5-HT4 receptors. Planta Med. 2011 Jul;77(10):973-8. Giacosa A, Guido D, Grassi M, et al. Effects of Ginger (Zingiber of cinalis) and Artichoke (Cynara cardunculus) Extract Supplementation on Functional Dyspepsia: A Randomized, Double-Blind, and Placebo-Controlled Clinical Trial. Evid Based Complement Alternat Med. 2015;2015:915087.